SP's birthday is later this week. We kicked off his birthday celebrations early with brunch at Casbah yesterday. It was a gorgeous sunny & warm day. Happily, we were seated in the garden patio area so there was lots of sunshine. 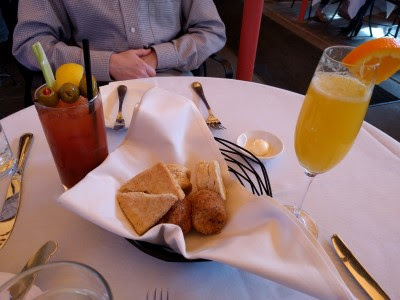 To start: Bloody Mary for him, Mimosa for me, and a "bread" basket of banana-chocolate chip muffins, biscuits, and lemon poppy scones with orange butter. 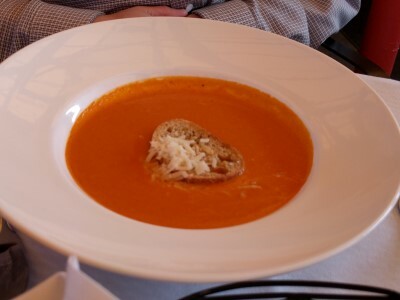 SP started with Tomato & Basil Bisque (parmesan crostini). It's still one of his favorite tomato soups. I like that it is smooth, not chunky. 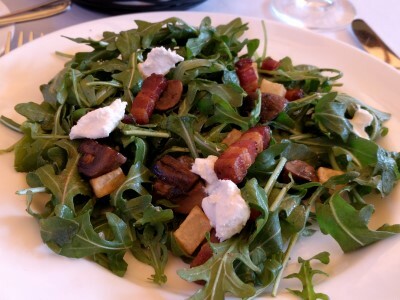 I started with one of my favorite salads: Arugula (crimini mushrooms, house-made pancetta, potatoes, pancetta vinaigrette, Riverview Farms goat cheese). Still delicious with lots of tasty bacon, mushrooms, cheese, and potato. One of us always orders Braised Lamb & Eggs (braised Elysian Fields Farm lamb shoulder, spinach, poached local eggs, tarragon, grilled sourdough). This time SP ordered it but I got to have a few bites. 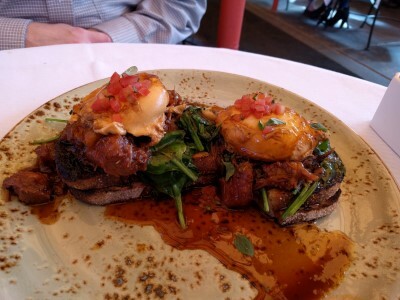 Still one of my favorite brunch dishes if not my favorite one. 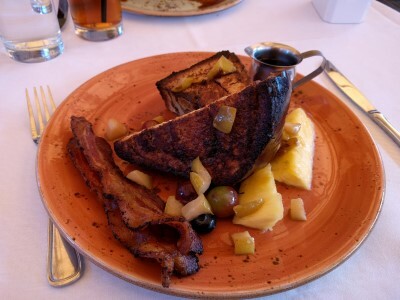 I opted for Brioche French Toast (apple compote, fresh fruit, choice bacon, chicken sausage or sausage). I love this cinnamon brioche. This time, however, it didn't seem like the brioche soaked in egg long enough and it was a little too grilled/crisp for my taste. I was a little disappointed. The bacon was excellent and I liked the apple compote and blueberries/grapes. We were too full for dessert in spite of several dessert options tempting us. We both still enjoy using our Big Burrito Birthday Coupon for brunch at either Eleven or Casbah. The last 2 were at Eleven, so it was time for a return to Casbah. It is still quite yummy and pleasant, especially when it's warm and sunny and you're seated in a garden patio, and service is still wonderful.